I’ve been meaning to do another MagCloud project and finally got around to it. Having the SSD drive in my MacBook Pro helped with the heavy lifting of picture editing in Lightroom and layout and design in Pages. 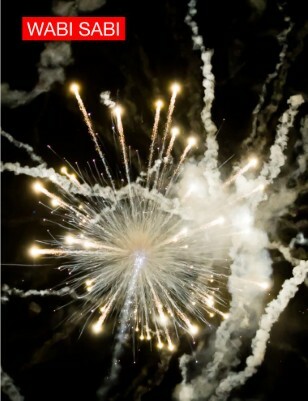 This issue of Wabi Sabi is my collection of images “fireworks from below” shot in 2008 on the 4th of July in Danbury, Connecticut. I’m pleased with what MagCloud has done with the printing and hope you will be too. There is no markup, the cost of production is the cost of the magazine. If you have the MagCloud app installed on your iPad you can view the first two issues of Wabi Sabi on the iPad at no cost. For those who missed it, here’s my post on publishing the first issue: Wabi Sabi, Issue 1. This image, which I took for the artist Joy Brown in June is on the cover of the September, 2009 issue of Chronogram, an arts and culture magazine distributed in the Hudson Valley of New York (as well as Kent, Connecticut). Chronogram’s art director, David Perry has done an excellent job reprocessing the image and integrating it with text. I’m delighted. This is the annual report for Salon, one of the first and what used to be one of the best progressive magazines on the web: Form 10-K for Salon Media Group Inc. Salon has a history of significant losses and expects to incur a net loss from operations for its year ending March 31, 2009. Because of past losses, an anticipated loss next year and a history of negative cash flows from operations, Salon’s independent registered public accounting firm for the years ended March 31, 2008, March 31, 2007 and March 31, 2006 have included a paragraph in its reports indicating substantial doubt as to Salon’s ability to continue as a going concern. During the last three years, Salon has relied on cash from bank debt, the issuance of convertible notes and preferred stock and from the exercise of warrants to meet its cash requirements. Part of the story, although it’s hard to say how much of it, is the editorial direction of current editor Joan Walsh. A number of us who have been reading Salon for years (me since it’s founding) find her editorial direction inept. She spends quite a bit of time as commentator on MSNBC and brings some of that television mentality to what used to be a web site full of well considered, deeply thought, and well written pieces that took issues beyond typical television divisive sound bites. She doesn’t seem to know how to frame an issue in a way that helps her readers better consider it and get beyond it. She has been called a “concern troll” by many. She is a problem. Salon has a community of commenters, one of the most articulate and outspoken of any that I’ve been involved with and large numbers of these people are now bailing: not commenting on current articles and not renewing their Salon subscriptions. Some of this is part of the trend cited in the annual report but some of it is a direct reflection of Joan’s mishandling of editorial control over the site. Her last post’s comments had to be closed because people were rioting: last page of comments on Betrayed by Obama. For the past year each of her pieces has at least one commenter (many have dozens) who states openly that as a direct result of Joan’s editorial leadership, they will not be re-subscribing to Salon. One of those commenters has started a Salon Parody site and their latest post is the source for my post here: We’re Concerned About Salon’s Future. All of this is a real shame because Salon has some of the best writers in the business, including the now infamous Glenn Greenwald and many others. I still read Salon but not with the enjoyment of times past. It will be sad to see Salon go, we need all the articulate progressive voices on the web we can get.